Rich, buttery organic whole cashews - raw, unsalted and ready for cooking or wholesome snacking. They’re just as good on top of a breakfast bowl as they are thrown into a stir-fry or curry for dinner. Or eat straight up as a snack in between: creamy, nutritious and very moreish. We love them in a crisp cucumber and radish salad, chucked into a quick vegetarian stir-fry for some extra protein, or by the barbecue in our curried cabbage and apple coleslaw. Infinity Foods are a fantastic ethical supplier that we are really happy to be working with. They’re committed to promoting organic farming, and have been at the forefront of the campaign against GMO. All of their organic products are grown sustainably and certified by the Soil Association. They are also trying to offset their carbon, while they work towards the ideal of becoming a zero waste business. It’s not just the planet that Infinity Foods is trying hard to protect, but also its people. Infinity Foods develop real relationships with their growers and producers in the developing world, and ensure that people are always given a fair deal. 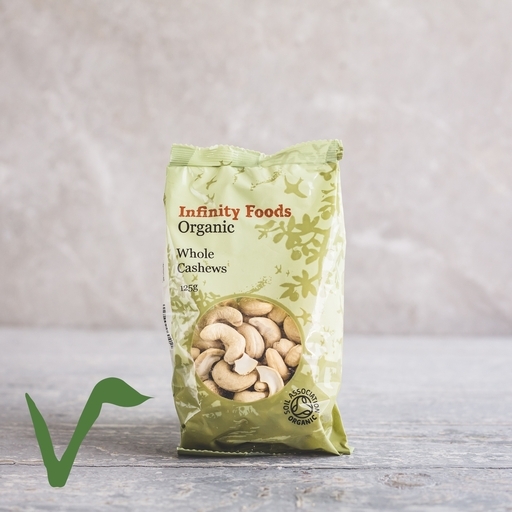 Their cashew nuts come mainly from growers co-operatives in India which are supported by Rapunzel Hand in Hand, occasionally supplemented by ethical growers in Vietnam. Rapunzel Hand In Hand is a pioneering project that aims to support both fair trade and ecologically friendly farming in developing countries. These organic cashew nuts are cultivated and processed in the Maharashtra and Goa states of India. Around 3000 small-scale organic farmers are paid above the current local market price for their nuts. The workers dry, peel and pack the nuts in healthy safe conditions. They are guaranteed work all year round and paid fairly for their labour. They also enjoy social benefits including paid holidays, new clothes and shoes, a company kindergarten, and benefits to buy school materials for all their children.